Who says I'm not into the holidays? Thanks to Phil Plait for providing the image, which I think he got from The Slumbering Lungfish. Extra points if you can correctly guess which side of the photo to place the sun! To the right, of course. 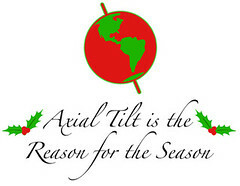 The reason that it's colder in the northern hemisphere in December is because the axial tilt means the sun's light strikes a a more oblique angle - more atmo to get thru and less direct energy. Tons of fun and happy hollandaise to you and yours.